Fabrique Délices just redesigned its website; the new design gives a fresh look that better reflects the high quality of the company’s products. “We wanted to create a style that accurately reflects the artisanal side of our products with a twist of modernity,” said Sébastien Espinasse, Vice President of Sales and Marketing. The company is currently redesigning the packaging for its entire line of products: pâtés, rillettes and mousses, truffle butters, dry and cured meat, specialty meats and all-natural sausages. The new modern design features a bright color palette that catches the eye. Each label is printed with vivid colors and with the product name written on a chalkboard. This emphasizes the authentic and traditional aspect of the products. This combination creates just the right style for Fabrique Délices charcuterie. With this new change, the products immediately stand out on grocery store shelves. 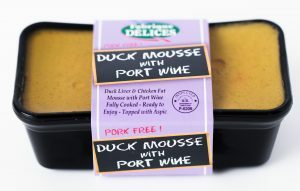 Charcuterie products have, undoubtedly, trended over the last few years – however, pâtés, rillettes and mousses are still unfamiliar to the American diet. In order to demonstrate how to enjoy these specialties, Fabrique Délices sleeves provide easy-to-understand instructions: within the sleeve, drawings detail how to build a charcuterie board, how to unmold pâtés, how to store the products and more. “We want to be sure to provide the tastiest experience for our customers,” said Sebastien. The new look has now shipped to retailers nationwide and has received great feedback from customers. 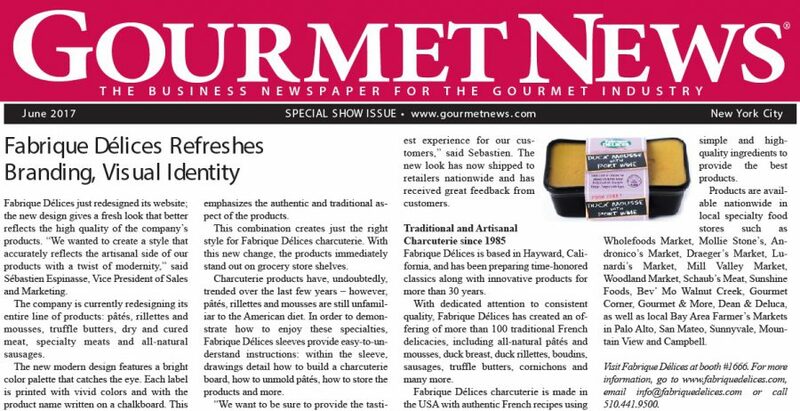 Fabrique Délices is based in Hayward, California, and has been preparing time-honored classics along with innovative products for more than 30 years. With dedicated attention to consistent quality, Fabrique Délices has created an offering of more than 100 traditional French delicacies, including all-natural pâtés and mousses, duck breast, duck rillettes, boudins, sausages, truffle butters, cornichons and many more. Fabrique Délices charcuterie is made in the USA with authentic French recipes using simple and high-quality ingredients to provide the best products. Products are available nationwide in local specialty food stores such as Wholefoods Market, Mollie Stone’s, Andronico’s Market, Draeger’s Market, Lunardi’s Market, Mill Valley Market, Woodland Market, Schaub’s Meat, Sunshine Foods, Bev’ Mo Walnut Creek, Gourmet Corner, Gourmet & More, Dean & Deluca, as well as local Bay Area Farmer’s Markets in Palo Alto, San Mateo, Sunnyvale, Mountain View and Campbell.